It can be hard to stay on track and keep routine when you’re travelling. New time zones, foreign languages and foods can really be a hurdle. But I’ve just some back from three weeks abroad and feeling pretty confident I’ve mastered it. THIS “appetiser” was legit. bigger than my head. One of my BIGGEST travel hacks for long flights is to request a special meal. You can choose when purchasing your ticket, and select from a huge selection, along with the usual Vegan, Vegetarian, Gluten Free etc, you can pick groovy things like: Low Fat, Low Carb, Low Calorie, Just Fruit, some planes even offer Keto meals! Your meal comes out first, you get great service and they're super attentive to your needs. Picking 'Just Fruit' means I get a heap of fresh fruit (often lacking on planes) or the 'Low Calorie' option is usually quite plain and free from sauces/dressings etc. This just helps my digestion as I can get extremely bloated and feel quite sluggish, so these 'lighter' options help get me through. When you can, try to book AirBnB’s. Try to pick places with little kitchens or serviced apartments. Not only are these often cheaper, but you have so much more freedom, food-wise. Choosing to have a meal at home (even breakfast) will save you money and help you have at least one healthy meal each day. Choosing some fresh fruit and cereal is an easy win and will start you off on the right foot. Eat when you're hungry. 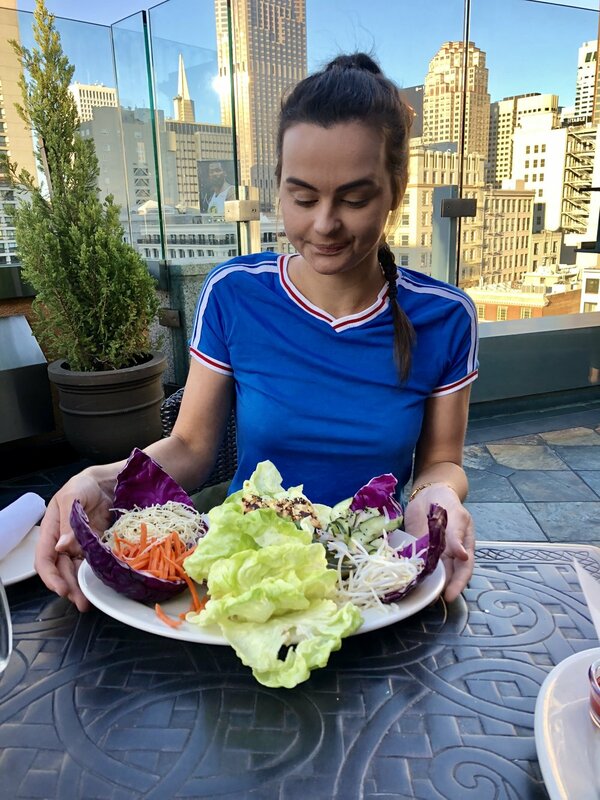 My eating patterns change so much when I’m away, the different weather, change in routine and different cultures make it almost impossible to stick to usual meals - but that’s not a bad thing. Eat when you’re hungry, eat to your appetite and not the clock. Tools that help. There’s a heap of tools you can use to help you make healthy food choices when eating out. Check out https://www.happycow.net/ if you’re a Vegetarian, Vegan or have dietary requirements, it’s a huge database of cafes or restaurants which will have great food for you. Tripadvisor reviews are also a handy tool to suss out. Familiarise yourself with the restaurants/cafes and their portion sizes. Either have a sneaky look on Instagram before, or scope out the meals once you enter. Doing your research might help prevent an awkward encounter of too much food (photo above!) I found that in America, a lot of the time portions were HUGE, so we could split one between two. Also, most American outlets offer a complimentary side of salad or soup, so keep that in mind too. Order veggies at every lunch & dinner. As much as you can, try to incorporate a serve or two of veggies at lunch and dinner. Filling up on veggies will help you with portion control and the fibre content will help keep you regular. Wear super comfy shoes. Make the most of your surroundings and walk as much as you can. Trying to get an uber on limited WiFi is also a serious headache. You may also be surprised by how many steps you actually end up clocking in! The first day in LA, my boyfriend and I totalled 41,000 steps, and that wasn’t even with designated hikes or trails. Sheer happiness post grocery shop. Have the best time. Probably the most important take out from the article - don’t ruin your holiday scrutinising over calories and counting kilojoules. Embrace the experience, try new foods, stay active and enjoy the adventure. I personally, loved walking around grocery stores and looking at all the different foods, flavours and packaging. So here’s a picture of me stocking up on Graham crackers in the States, seriously - could I look any happier? !